Fond of all aspects of emergency medicine, Dr. Rebecca Aldoretta’s particular interests include endocrine emergencies, transfusion medicine and critical care nutrition. 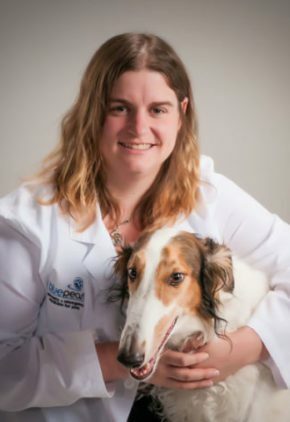 Dr. Aldoretta likes to read, draw, and go hiking and exploring with her husband and German shepherd mix Maya. 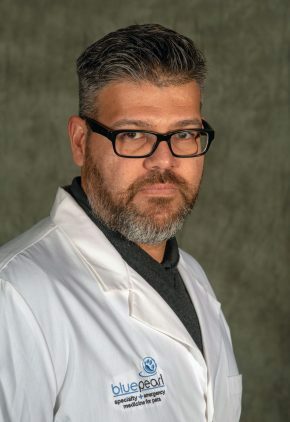 Dr. Pedro Boria completed residencies in both internal medicine and oncology, and he enjoys all aspects of oncology. A sports fan, Dr. Boria especially likes playing golf and scuba diving. He also enjoys spending time with his wife and two kids. 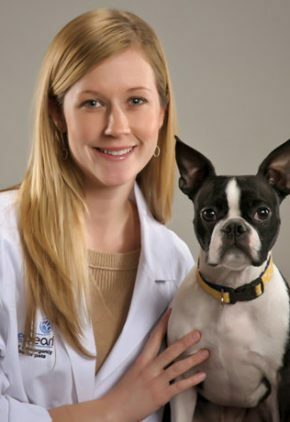 Dr. Breanna Erwin enjoys being able to provide support and care for clients and their pets during emergency situations. Dr. Erwin's favorite pastimes include hiking, reading and visiting national parks with her husband. They have two dogs, Harvey and Emerson, and a cat named Addison. Dr. William Fischbach enjoys all aspects of emergency medicine and has special interests in emergency surgery and trauma. Dr. Fischbach enjoys golf, traveling and spending time with his wife and daughter. 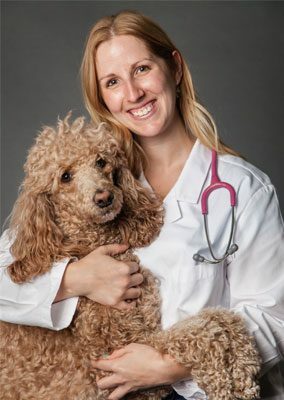 Knowing from childhood that she wanted to be a veterinarian, Dr. Christine Fox's particular clinical interests include sepsis and respiratory cases, especially mechanical ventilation and nosocomial infection treatment. 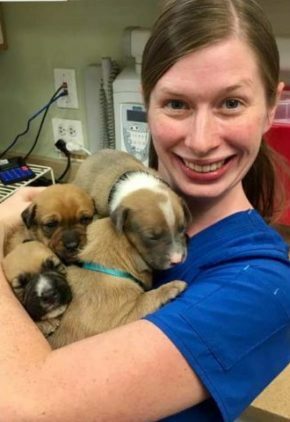 She has also participated in research on the presence of ventilator-associated pneumonia in dogs and is excited about incorporating into veterinary medicine the growing advances in treatment options available in human medicine for these types of cases. Dr. Fox enjoys volunteering with groups within her church. She also keeps active with spinning, yoga and marathon training. Her three dogs include standard poodle Cosee, Shih Tzu mix Nellie, and miniature poodle Mocha. Dr. Caitlin Goeres particularly enjoys surgical cases, such as trauma, lacerations and fractures because she is able to see almost immediate improvement. She also finds pain management gratifying. Favorite pastimes of Dr. Goeres include hot yoga, English pleasure horseback riding, social and ballroom dance and dog agility. She and her husband have a daughter and many pets: Mya, a husky lab cross; Milou, a miniature poodle cross; Moksha, a spaniel mix; sibling cats, Daniel and Levon; and Thoroughbred ex-racehorse Ringer. 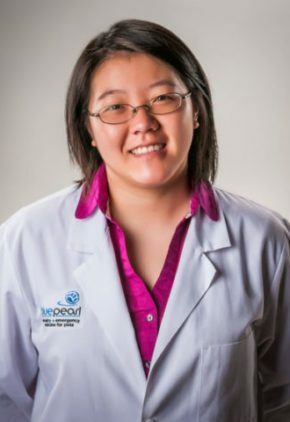 Dr. Lauren Hai is particularly interested in wound repair, trauma and toxicity cases. Dr. Hai has a variety of hobbies and interests, to include video games, building computers, gardening, traveling, swimming and crafting. The family has three pets: great Dane mix Byron, shepherd mix Xena, and cat Ellie. Dr. Emily Harison enjoys the challenges of complicated internal medicine cases and long-term care in chronic illnesses. She is most interested in immune-mediated disease, hematology, kidney disease, gastrointestinal and endocrine diseases. 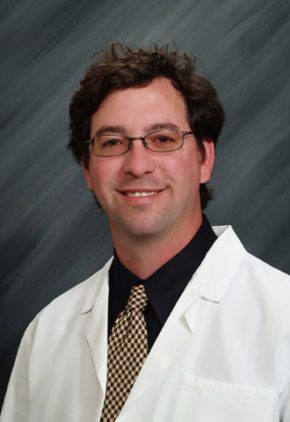 Dr. Harison loves performing diagnostic and therapeutic procedures including endoscopy and ultrasound. Dr. Harison enjoys hunter jumper equestrian sports with her horse Olive. She also enjoys yoga, outdoor activities and live music. Her pets include pit bull mix Piglet, Boston terrier Finn, and cat Simon. Dr. Hsieh has a special interest in wound management and surgery. 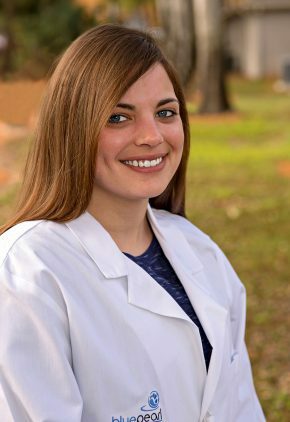 Dr. Carlie Koonce worked a number of years with a livestock market, the USDA and in a rural mixed animal practice before coming to BluePearl. Some of her favorite conditions to treat include pancreatitis, endocrinopathies and feline urinary obstruction. Another clinical interest is enteral tube feeding. Dr. Koonce’s favorite pastimes include hiking, reading, photography, hunter/jumper horseback riding and museums. Roo is her border collie mix, and her three cats are Draco, Badger and Baby. 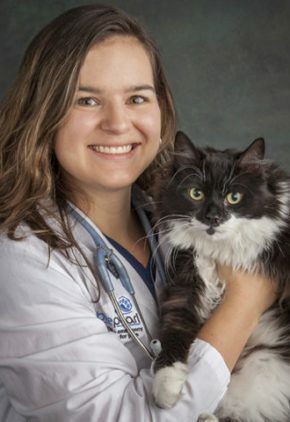 Dr. Julia Merriam’s particular interests include infectious disease, feline medicine and auto-immune disease. She also enjoys ultrasound, endoscopy and interventional radiology. Dr. Merriam stays active volunteering for a number of social and political organizations. In addition to being a bad gardener, her favorite pastimes include knitting, weaving, cooking, forging metal and blades, making beer and beekeeping. 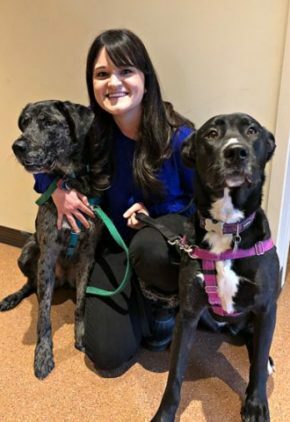 Her pets include cats Lance Corporal Carrot, Granny Esmerelda Weatherwax and Matisse are blind Persian cats, AKC champion Borzoi Gossip, and king snake Diego. 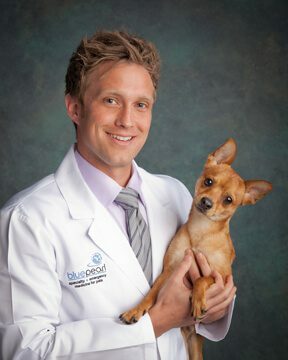 Dr. David Wilson has participated in clinical and basic research earning multiple awards in the areas of fracture traumatology, minimally invasive treatment of canine disorders, angular limb deformities and treatment of upper airway disease. His surgical interests include minimally invasive techniques laparoscopy, thoracoscopy, arthroscopy and minimally invasive fracture fixation, cardiothoracic procedures, surgical oncology, surgical therapy of elbow dysplasia, treatment of cranial cruciate ligament disease and fracture traumatology. In addition, he has a special interest in bracing and prosthetic solutions for the primary or supplemental treatment of an assortment of orthopedic conditions. 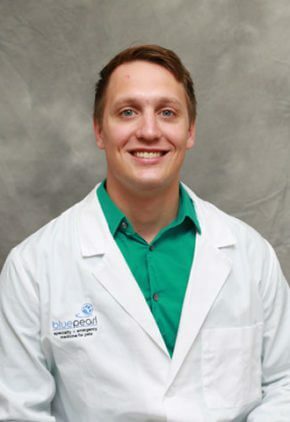 Dr. Wilson also enjoys working closely with patients in post-surgical rehabilitation. Dr. Wilson enjoys traveling, scuba diving, running, swimming, supporting the Chicago sports teams, wine collecting and exploring all the great things the city has to offer. Dr. Jordan Yesesky is particularly interested in surgery and emergency stabilization. Dr. Yesesky and his lab mix, Fitz, can often be found at the park playing with a tennis ball or walking around the city exploring. Kipper Noodleman Snugglesworth, III is the cat in the family. Dr. Yesesky, Fitz and Kip like to curl up on the couch reading a book or watching cooking shows.